Although Welsummer chickens are associated with Welsum, Holland the breed was originally developed in the area along the river Ysel to the north of Deventer, Holland at about the same time as the Barnevelders (1900-1913). The original birds showed a hotch-potch of colours and physical variations i.e. 5 toes, blue tails, yellow body feathering. Fortunately efforts were made to improve the breed and a farmer's son from the village of Welsum made trial crossings with other breeds especially Barnevelders and it was this crossing which proved to be the most stable and constant. Later other farmers in the area began to buy stock from this source and the breed known as Welsummer, became established. In 1921 the originating breeder was invited to exhibit the Welsummer at the first World Poultry Congress at The Hague, Holland. In 1922/23 because of its uniformity, steps were taken to standardise the breed. 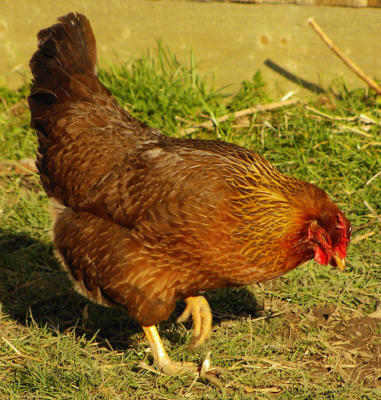 In 1927 the Dutch Association for the Improvement of the Welsum Poultry Breed was founded. The Welsum breed arrived in England in 1928. 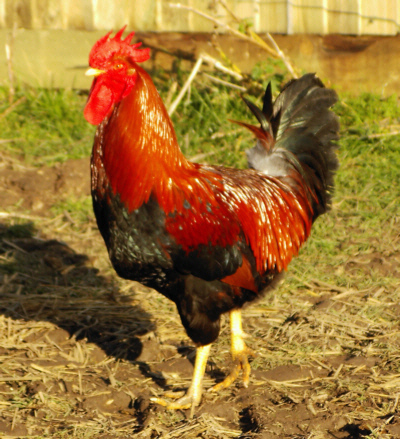 The typical 'Farmyard cockerel' - the bird you see on the famous cereal box! They are excellent foragers on free range. In fact, out of all the different breeds we have, it is the Welsummers that spend the least time at their feeders, managing to make the most of their environment. A truly organic breed, the Welsummers are very attractive birds and people often describe the cockerels as just the type you see in books and on retail products. They are friendly birds and really give the place a farmyard feel. They are probably best known for the eggs they lay. These eggs have been described as "a rich deep flower pot red". They really are the most beautiful large brown eggs you're likely to see but because their production qualities are lower than other utility breeds you would be very unlikely to buy a dozen Welsummer eggs from the Free-Range section at any supermarket.